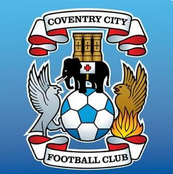 Discussion in 'Coventry City General Chat' started by Nick, Oct 3, 2018. Congrats. I've been to Scunthorpe, Oxford (cup), Rochdale, Rovers, Sunderland and Pompey. Hasnt Camwell been on the bench for the U23 with the new lad McCallum preferred? Camwell came off the bench for last 20 last Friday. A few of the regular lads were rested that game due to playing in the Birmingham Senior Cup on Wednesday night. Played 90 mins on Wednesday left of a back 3 so I don't see him being involved tomorrow unless he's on the bench. Yeah, he seems to be mostly in a 3 as a central defender than a full back. Robins has said he needs to work on his defending a couple of times so I suspect that's why he's being played there. We already know what he can do going forward. ESB1 is avaliable for selection. right, I'm on my way, safe journey troops, fingers crossed for 3 points. If anything goes wrong on that boat I'm baggsying the rubber ring! Earlsdon_Skyblue1 and letsallsingtogether like this. I'll be looking out for you all from my Hotel window. Will give you a Skybluearmy and a wave of my scalf. I stayed in a hotel down there where the front rooms over look the river but the back ones look straight into a block of flats! Cant rember its name. Which one you in? Better wrap up boys weather down here pretty poor at the moment. Hope it suits our boys 2-0 to us today. I'm in the Double Tree Hilton on Canary Whalf waiting for the ferry to start so we can cross the river. I'm in the triple tree Hilton. I'm in the Out of My Tree Keresley. TewkesburySkyBlue, Pete in Portugal, standupforcity and 2 others like this. Will Dom Hyam miss Saturday? “Yes, I imagine that to be the case. We are down to the bare bones and there will possibly be a 17-year-old on the bench on Saturday but we have to deal with it. I have my fingers crossed and am hoping that Charlton aren't at all athletic this afternoon. It’s twice in 18 visits. Good omens and all that.. This boat not going well. No free bar. Seems like they've fucked over Cov fans. Really want us to win today, these 15hr shifts are killing me right now. Alas, I can see us getting beat soundly today, brain says 3-1 loss, heart says 1-1 draw. At least the boat turned up unlike the coaches though! Or the old classic, Ben Dover.